It looks like this is a lot more challenging than I thought it would be… Here is a hint: this is one of the classic localities for the geological features that you can see in the image. Mud Volcanoes in eastern Azerbaijan.The clue definitely helped me focus my search. 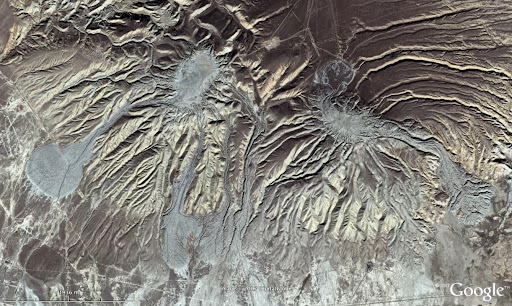 I had already recognized the northern hemisphere location from the shadows and I suspected that the grey tongues looked a lot like mudflows. On reading your clue I immediately thought mud volcanoes (probably because I consciously or subconsciously figured you were posting about some place associated with petroleum geology), and that quickly led me to Azerbaijan. Didn’t take long then…It’s remarkable to me how many recent WoGEs have been nearly or completely vegetation free, and yet in such climatically (or at least geographically) distinct regions. True, there’s an element of aridity to all of them, but none were in the classic desert regions I would have first guessed. Thanks, Ron – I started to think that I had to give more clues. It is interesting that the very vague hint I gave actually helped.It’s a good idea to post the KML or KMZ file instead of the coordinates — but I could not open the file for some reason.Looking forward to #70. John — I have never been to the mud volcanoes in Azerbaijan. This BBC news article seems to suggest that it shouldn’t be very difficult to visit them. There are some smaller mud volcanoes in Romania, in the Carpathians, I have seen those — but they don’t have high-resolution imagery in GE. Where on (Google) Earth #70 is up.Zoltán: I’ve had some issues with the KMZ links, too. I suspect that it has something to do with all of the special characters and spaces. I have seen something else, at least on my own computer. If I follow the KMZ link with Google Earth already opened I get an error message; if I follow the link with Google Earth closed it works OK (Google Earth opens and the placemark comes right up). Would you take a stab at trying to duplicate this behavior?